Each $62 box contains 20 packs. Each pack contains 8 cards. 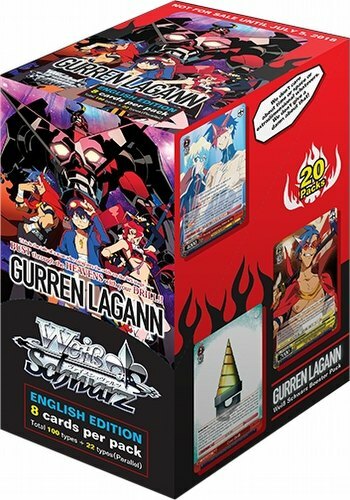 Bonus Offer: You will receive a free Weiss Schwarz Gurren Lagann play mat with every 4 boxes of Gurren Lagann boosters pre-ordered!Gurren Lagann boosters introduce brand new abilities never-before-seen in Weiss Schwarz. Picking up from the Trial Deck+, boosters focus on scenes from the rest of the anime until the end of the season. Build a Team DAI-GURREN deck, or perhaps a Beastmen deck, or even an Anti-Spiral deck! Look for mulitiple cards that strengthen the prowess of cards from the Trial Deck+. Look for signed cards from the voice cast - Tetsuya Kakihara (Simon), Katsuyuki Konishi (Kamina), Marina Inoue (Yoko), and Yukari Fukui (Nia). Every box includes 1 of 4 exclusive promo cards. There are 100 cards in the set plus 22 Parallels.